Aluminum chain link fenceis produced by cold-drawing good commercial grade steel rod into wire of the appropriate diameter. The steel rod from which the wire is drawn shall be produced by the open hearth, electric furnace or basic oxygen process. The coating is produced by passing the cleaned wire through a molten bath of aluminum metal. Aluminum Chain Link Fencing Features: Corrosion resistance, Lightness and nice appearance, Long life time, High tensile and easy installation, Adapt to the harsh environment. The base metal of the chain link mesh is composed of commercial quality medium-carbon aluminum coated wire. The wire is coated with aluminum to produce a smooth and uniform coating. The weight of aluminum coating, wire sizes with allowable variances, and wire breaking strength, conform to ASTM A 817 for the wire size specified. The wire is aluminum coated before weaving. ASTM A 491 Aluminum-Coated Steel Chain Link Fence. ASTM F567 Installation of Chain Mesh Fencing. ASTM A 817 Metallic-Coated Wire for use in Chain-Link Fence Federal specification. RR-F- 191 K/1 D Type II, Fencing, Wire and Post Metal (Chain-Link Fence Fabric) American Association of State Highway Transportation Officials M-181 Chain Link Mesh, Type II. Chain link fence end types: K- Knuckle, B- Barb. Aluminum coated (aluminized) steel chain link for commercial, industrial and institutional applications. Aluminized fabric is contained in various government specifications for use in prison, road, dock, airport, housing, forestry, and military use. 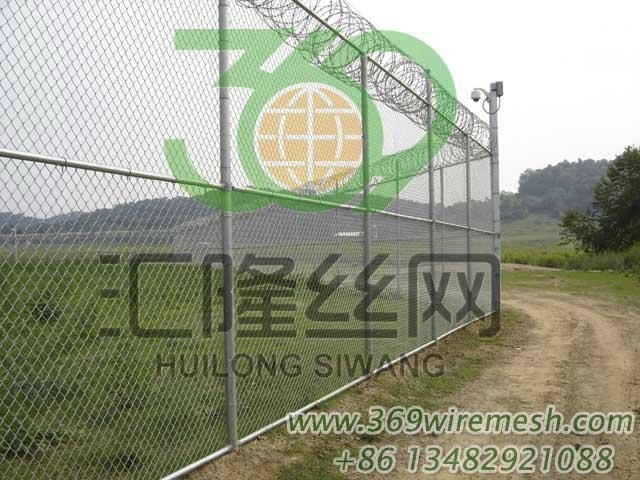 Here is the chain link fence, barbed wire, other accessories specification needed.Standard 50 x 10 gauge (mesh x gauge) Aluminum chain link Mesh (3M high x 2600M Length) (3.1 - 3.24mm diameter).Strands of Aluminum Barded Wire (2.2mm diameter).Strands of 3.25 mm straining wire (4.0 - 5.5mm diameter).25 x 4 mm galvanized steel metal beading.65mm x 65mm x 6mm galvanized steel angle.Straight barbed wire: 2.5mm diameter.Barbed wire spring (for making wire barbs) : 2.2mm diameter.Line straining wire (straight wire): 4.0 - 5.5mm diameter.Chain link for mesh: 3.1 - 3.24mm diameter.aluminum alloy is Al Mg 2.5 or equivalent.